Natural cold and flu remedies: What works? If you've got the cold or the flu, you may be tempted to reach for a natural way to treat your illness. With so many items on drug store shelves claiming nature-made ways to cure what ails you, who knows what to trust? CBSNews.com spoke to experts about common natural ingredients found in flu and cold remedies or natural items that supposedly combat these illnesses to see whether they've been shown to help. A 2010 National Institutes of Health study showed that children who took daily vitamin D supplements (1,200 IU) were 40 percent less likely to get a common flu virus than kids who took a placebo. Dr. Robert Graham, internist at Lenox Hill Hospital in NY who specializes in natural remedies regarding how to fight colds and flu, said that most people need at least 1,000 IU a day and some need 2,000 IU daily or higher to reach levels that appear necessary for optimal immune responses. However, an October 2012 study in JAMA showed that people taking vitamin D supplements had an average 3.7 cases of cold or flu, compared to 3.8 in the placebo group, which suggests no significant benefits from the vitamins. The vitamin D group didn't change the duration of the cold or flu -- about 12 days in both groups -- the number of work days missed, nor the severity of their illness. Green tea (Camellia sinensis) contains polyphenols, potent plant antioxidants which are believed to give green tea its immune-boosting effects, Graham explained. Graham said to maximize benefits and minimize bitterness, use just-below-boiling water and steep green tea no more than a minute or two. A little lemon and honey can also help blunt the bitterness. Don't add milk, because the proteins will bind to the polyphenols, making them ineffective, he said. Also, teas made from demulcent herbs, like slippery elm bark (Ulmus rubra), marshmallow root (Althea officinalis), and licorice root (Glycyrrhiza glabra ) are traditionally used to soothe sore throats. A 2003 National Institutes of Medicine study of 60 adults showed demulcent herbs significantly improved symptoms of pharyngitis compared with placebo. Vitamin C, found in various non-prescription cold remedies, does little to reduce either the length or severity of colds among the general population and has not been proven to treat the common cold, Dr. Jennifer Collins, an assistant professor of Allergy and Immunology at The New York Eye and Ear Infirmary, said. However, Graham said one study showed that it may lower the risk of catching a cold among people whose bodies are under high physical stress. They were 50 percent less likely to catch a cold if they took a daily dose of vitamin C.
Probiotics: These so-called "good" bacteria -- found in yogurt, sauerkraut and other foods -- not only suppress the growth of "bad" bacteria but also might activate the immune system to fight off diseases in other ways, Graham said. In one University of Vienna, Austria study of 33 healthy young women, both "regular" yogurt and so-called "probiotic-fortified" yogurt (which contained added beneficial bacteria cultures) for two weeks were found to boost immune system T-cells by 30 percent. Early treatment by using zinc lozenges may shorten the duration of common cold symptoms by several days, Graham pointed out. Collins, who is a medical spokeswoman for Cold-EEZE Cold Remedy which is a zinc lozenge, said that studies by the Cochrane Review, Cleveland Clinic and Dartmouth showed that zinc can shorten a cold's duration by up to 42 percent. However, she said that the zinc lozenge has to be taken at the first sign of a cold to reach those affective rates. Some people might try to irrigate their clogged nostrils using a Neti-Pot or a nasal wash device. While Collins said it has been proven to move the mucus from your nasal cavities, there are dangers of using unclean tap water in these devices. "Brain-eating" amoebas known as Naegleria fowleri typically live in fresh water, but if it makes it into your tap water and then into your nose it can cause an infection known as primary amebic meningoencephalitis (PAM). Two people in the U.S. died from using tap water that was likely carrying this bacteria in their Neti-Pots last year. The FDA says using distilled or sterile water or boiling water for three to five minutes and then cooling it until it is lukewarm can help get rid of unwanted organisms. Oscillococcinum may reduce the duration of the flu by about six hours, but has no effect on preventing it, Graham said. Thus, the data are not strong enough to make a general recommendation to use Oscillococcinum for flu. What we do know is the tiny, white spheres are made up of Muscovy Duck liver and heart extracts and sugar, which is what gives it its sweet taste. Evidence suggest that daily showers with warm water followed by cold water, or cold water alone may reduce the duration and frequency of common cold symptoms, according to Graham. In Europe, steam baths have been shown to reduce cold symptoms, he added. Hydrotherapy in general however has been used to treat pain symptoms in some patients including disabled people and stroke survivors. Numerous reports suggest that chicken soup may alleviate symptoms of the common cold. A 2008 study conducted by researchers at the University of Nebraska Medical center concluded that chicken soup may contain a number of substances with beneficial medicinal activity. The soup cause a mild anti-inflammatory effect that is known to ease the symptoms of upper respiratory tract infections - although admittedly scientists did not know which component caused this effect. Under laboratory conditions, three batches of chicken noodle soup (but not the broth alone) were shown to reduce the movement of neutrophils -- common white cells in the blood that ward off infection. 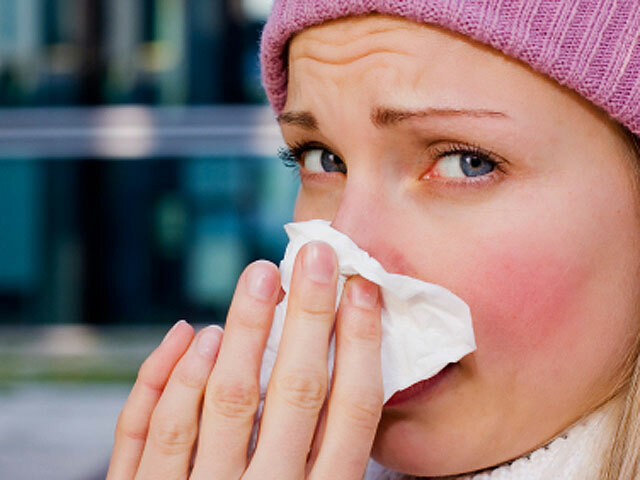 Theoretically, stopping neurtrophils from going elsewhere reduces activity in the upper respiratory tract that cause cold symptoms. "It was the only time in my life when I could work in the lab and taste the samples," Ronald Ertl, who at the time worked as research coordinator of the lung biology laboratory at UNMC, joked in a press release.